In the early days of WW2 very little assistance was available to soldiers who found themselves ‘adrift’ from their regiments. Many men, who had been captured in the aftermath of the mass evacuation from the beaches of Dunkirk, managed to escape then walk alone southwards, cross the Pyrenees and eventually reach Gibraltar. Under the Geneva Convention, officers who were captured did not have to work but prisoners of ‘other ranks’ found themselves being forced into long hours of hard, physical labour – down coal mines or salt mines, in the fields, or on any task chosen by their captors that did not ‘officially’ involve weapons, ammunition or helping the war effort. Only a few weeks earlier the conscripts and Territorial Soldiers amongst those ‘other ranks’ had been working in factories, shops, banks, and many other trades. Most had little experience of the world beyond their immediate home localities and had never been overseas before. Captivity was one new experience too many! The harsh conditions heightened the desire to escape. Some escapes were planned ‘break-outs’, others merely opportune occasions during work parties or visits to the doctor or dentist. Maps and escape aids were in short supply as prisoners were deprived of possessions, so improvisation and the instinct of self-preservation became key to survival. The instigator of the original ‘Escape Club’, Welshman Desmond Jones, was one of those determined escapers. Des was a former Royal Artillery Territorial who had escaped three times from camps in Italy; the third time he made it home! Being a well-mannered soul, Des had the courtesy to leave a note for the Camp Commandant, thanking him for his stay and asking him not to blame the men left behind. Des stated that he needed to go home because he was due to get married! Forty-eight days later Des had walked from Cava Manara, near Milan, to Frosolone near Compobasso in Southern Italy. Walking mainly at night and sleeping by day, he covered a distance of nearly 700 miles, which was a tremendous feat considering the undulating Italian terrain. 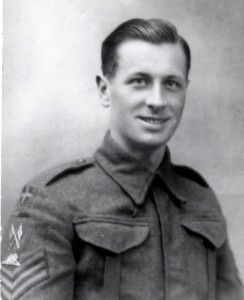 Des crossed the Allied lines on the 29 October 1943, accidentally stumbling into the sights of a patrol from the Hastings & Prince Edward Regiment of Canada, who were in an ambush position – after surviving his marathon trek Des was lucky not to have been shot at the moment of freedom. He arrived back in Liverpool on the 9th December 1943 and married Private Edith Kelley of the ATS at Macclesfield on the 08 January 1944. On demobilisation in April 1946, Des Jones returned to his pre-war job as a clerk on the Great Western Railway in Swansea. In the July he encountered a former officer from the Regiment who had also escaped from a POW camp; as a result of their reminiscing Des chanced on the idea of forming the Escape Club. He wrote to escapers that he knew and they in turn passed the message on to others. By August 1946 the club had thirty members. The only criteria for eligibility was that each member had to have escaped from ‘secure enemy custody’. At that time the membership were unaware of the existence of the Royal Air Forces Escaping Society [RAFES] so had not added reference to the Army in the club title. Sadly the club did not flourish immediately. With so many Army regiments and their regimental associations there was not one particular cap badge on which to focus allegiance. Post war times were difficult financially and interest from ‘officialdom’ was lacking. In 1947 Des handed over the reins of the club to a group of officers in London who thought that greater support could be canvassed in the city. Regrettably that official support was not forthcoming and the club officially disbanded. But this was not the end! Many former Escape Club members kept in touch with each other and with Des, unofficially. A loose infrastructure was formed again, with Des financing much of the administration himself. In 1988, with the fifty-year anniversary of the outbreak of WW2 approaching, Des decided to attempt to gain some publicity for the club. He wrote to Derek Jameson, a presenter of a BBC Radio 2 programme. A lengthy interview was conducted over the air and recruitment began. Letters poured in from WW2 Escapers. Most respondents sent stamped and addressed envelopes with their letters and Des replied requesting details and confirmation of their escapes. The club reformed, renamed as the Army Escape Club. 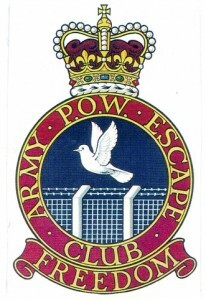 Later the title was changed to The Army POW Escape Club. The APOWEC altered its conditions of membership to include any former British Army POW who had escaped from ‘secure enemy custody’ in any theatre of war (including WW1). Initially, it was suggested that membership should be restricted to those who had successfully reached allied or neutral territory but it was soon realised that such a condition would be an insult to the many who had died whilst trying to escape or whilst ‘on the run’. It was therefore decided that it was the escape that mattered, not what happened later. Many VIPs offered their support for the club, including The Earl of Harewood (Colditz), Viscount Montgomery of Alamein, Dame Vera Lynn and the Duke of Westminster. The College of Arms produced two badges with the Royal Crown. Newsletters were produced. AGMs were held at different locations around England. Two branches of the APOWEC were formed, the Newcastle (Geordie) Branch and the Cheshire Branch; each had its own standard. Membership topped at 165 in 1993. In 1995, the 50th Anniversary of the end of WW2, it was decided that the time was apposite to place the club into dignified retirement. [The RAFES had also decided to retire at this time.] However, all retired personnel need a hobby, so although ‘officially’ retired, the club continued as APOWEC (R)! Major David Sharp BEM, a Korean War Escaper [therefore a mere ‘youngster’ to the WW2 cohort] took over as President and Tom Williams MSM took over as Chairman. The Duke of Westminster became the club’s Patron and Des Jones continued as Secretary keeping the organisation together. Life continued as before until 2000 when the club again went into retirement – and marched its membership into the Escape Lines Memorial Society! Details of the APOWEC are held by ELMS, The Imperial War Museum, The Imperial War Museum (North), and Eden Camp WW2 Museum in North Yorkshire. The APOWEC Standard is on display in the safe custody of the Cheshire Regiment Museum at Chester Castle. One of the two badges produced by the Royal College of Arms was presented to ELMS and is now on view in the Escape Lines display at Eden Camp Museum.